Today, Tina Maharath (D-Columbus) took the oath of office to serve in the Ohio Senate during the 133rd General Assembly. She is the first Asian-American woman to be elected to the Ohio Senate. Senator Maharath will represent the 3rd Senate District, which encompasses areas of Franklin County, including Whitehall, Gahanna, Westerville, New Albany, Groveport, Canal Winchester, the Hilltop and parts of Columbus. A native of Whitehall, Senator Maharath chose to dedicate her life to public service at a young age, inspired by her upbringing as the daughter of refugee parents from the Southeast Asian nation of Laos. Maharath is an active member of her community. 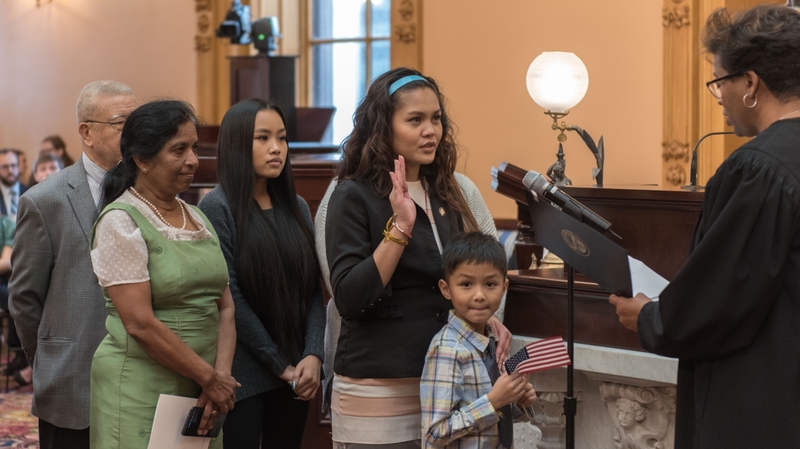 She has served on the Lao Volunteer Donation Association’s advisory board and on the organizing committee for Ohio’s Asian American and Pacific Islander Legislative Day, an event she went on to chair. She also volunteers for various organizations throughout central Ohio, including Legacies of War, Ohio Asian American Health Coalition, Community Refugee Immigration Services, Community Shelter Board and Asian American Community Services.